Four corners, four sides, four ways to sparkle and shine with this gorgeous geometric ring. The Emerald-Cut Garnet Solitaire Ring in 14K White Gold is a confident, worldly piece of jewelry that makes a bold statement at any occasion, particularly when worn on its own and allowed to be the center of attention. This stately ring features a solitaire emerald-cut garnet (6mm by 8mm) with a multi-faceted face that absorbs the light and positions the stone to reflect rich, deep colors of red and burgundy. On each corner of the garnet sits the polished tips of the solid gold arms that reach underneath to set the stone to the band. For a contemporary feel, the white gold band, measuring 4mm, is polished to a light satin finish to perfectly complement the outstanding color of the garnet. The round band and rectangular garnet create an unmistakable geometric delight. 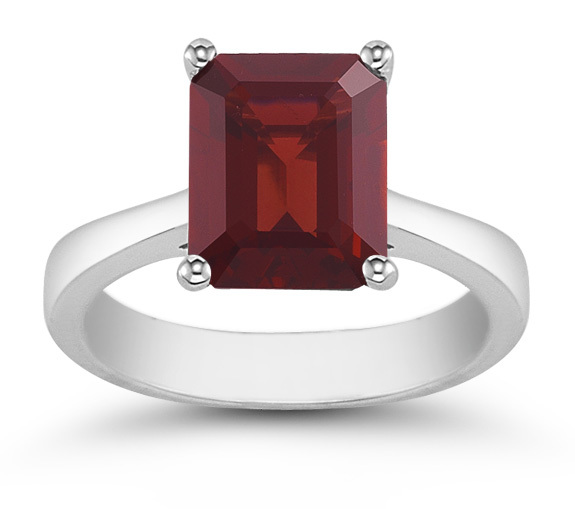 This single solitaire ring is all you need to leave a lasting impression, especially with a garnet of such interesting shape and rich color that will simply outshine all the rest. We guarantee our 8mmx 6mm Emerald Cut Garnet Solitaire Ring in 14K White Gold to be high quality, authentic jewelry, as described above.